Questions? Looking for answers in the middle of somewhere. What is this? A book launch? Yes, exactly! What is the name of the book? The book is called Questions? Looking for answers in the middle of somewhere. What is it about? 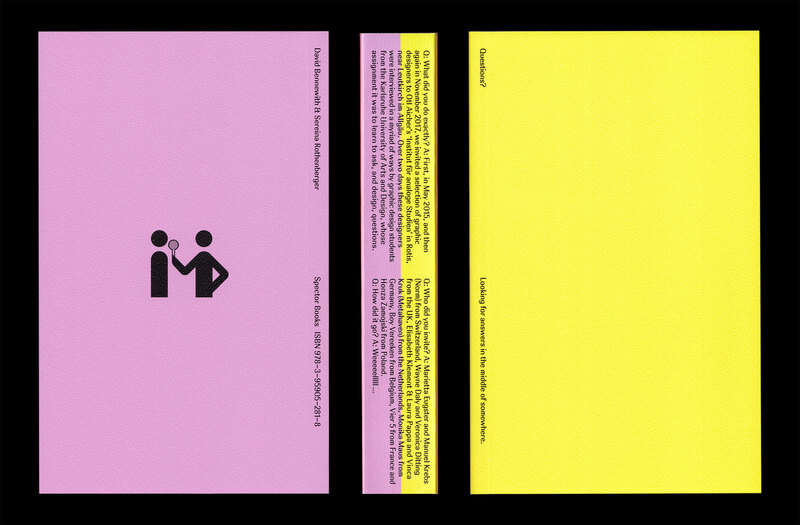 It started with Sereina Rothenberger & David Bennewith inviting a selection of graphic designers to Otl Aicher’s ‘Institut für analoge Studien’ in Rotis, in May 2015 and then again in November 2017. Over two days these designers were ­interviewed in a myriad of ways by graphic design students from the Karlsruhe University of Arts and Design, whose ­assignment it was to learn to ask, and design, questions. Who did you invite? Marietta Eugster and Manuel Krebs (Norm) from Switzerland, Wayne Daly and Veronica Ditting from the UK, Elisabeth Klement &amp; Laura Pappa and Vinca Kruk (Metahaven) from the Netherlands, Monika Maus from Germany, Boy Vereeken from Belgium, Vier 5 from France and Honza Zamojski from Poland. Who’s publishing it? Spector Books. What is the ISBN? Glad you asked, it is 978-3-95905-281-8. When will the book be launched? On Wednesday, February 13, 2019, 17:00, on the second floor of the HfG Karlsruhe. Bändelraum, to be precise.